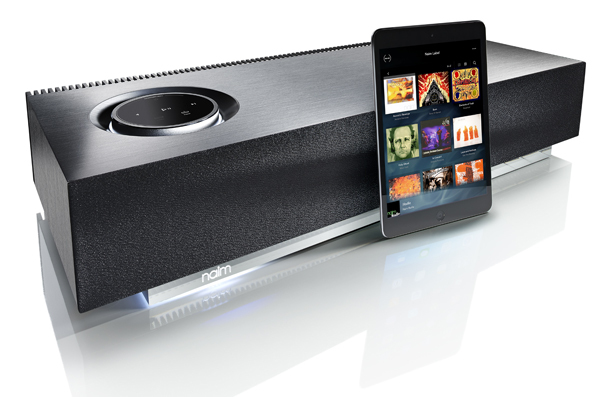 Much-anticipated all-in-one proves stylish and flexible – and it does ‘the Naim thing’, too! UPDATE: A new Naim control app for mu-so and other Naim network music products, mentioned in the review below, is now available for both iOS and Android smartphone and tablets. 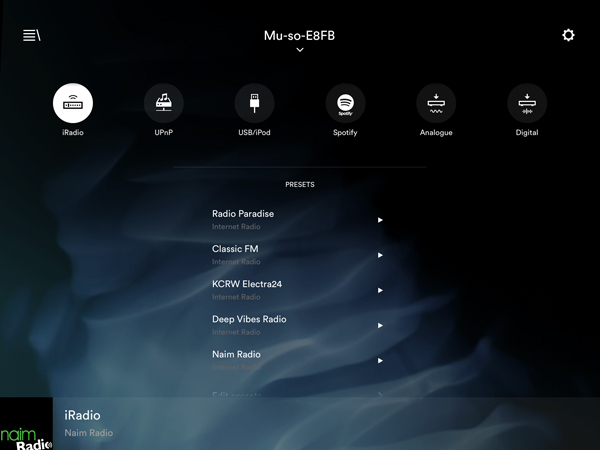 The apps require Apple iOS7 or above, or Android 4.0 or above and, as well as mu-so, can control Naim’s UnitiQute,/UnitiQute 2, UnitiLite, NaimUniti/NaimUniti 2 and SuperUniti all-in-one network music systems and the ND5 XS, NDX, NDS and NAC-N 172 XS network music players. I’ve been looking forward to getting a proper listen to the new Naim system, mu-so, since I heard it at the launch event back in April. At the time I wrote an extensive piece for this site about mu-so (or Muso as it was then called), giving the background to the system and some insight into its features and specification, but in response to the question ‘But how does it sound?’ I had to say ‘Not a clue’. 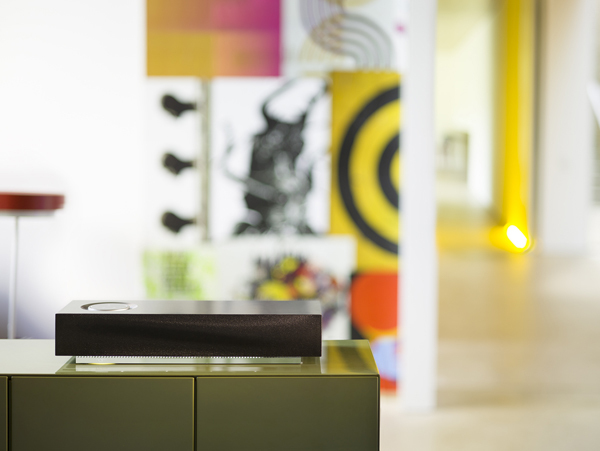 That was mainly because at this showing, and its subsequent outing at the High End Show in Munich in May, Naim chose to show multiple mu-sos (mu-si?) all working at once and thus making it pretty hard to form any sensible opinion. Now, however, I have a mu-so in front of me, and for the past few days have been experimenting with both the £895 system itself and the new Naim Control apps for both iOS and Android. 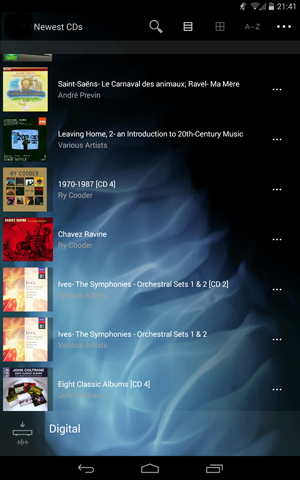 Yes, Naim fans, the Android app finally exists, and like the iOS version it will also control other networked Naims (the Unitis and ND-series network music players) in place of the existing n-Stream iOS app. Before we go any further, a note about that name: back in April, the system was the Naim Muso, but somewhere between then and now, it’s lost the upper-case ‘M’ and definite article, and gained a hyphen and a ‘by’. So ‘the Naim Muso’ has become ‘mu-so by Naim’, and it’s due in the shops very soon, both through existing Naim retailers and a more extended retailer base – Apple Stores and John Lewis branches are being mentioned. That original piece I wrote – here’s the link again in case you can’t be bothered to scroll back – covered most of the technicalities of the system, but here’s a brief summary. Mu-so is an all-in-one system, combining network music player, amplification and speakers, in a package around 63cm wide, 12cm tall and 25.6cm deep. It has both Wi-Fi and wired Ethernet networking, Bluetooth and Apple AirPlay wireless connectivity, and supports Spotify Connect, so Spotify Premium members can use their handheld device to select music, and then leave mu-so to take over playback, communicating directly with the Spotify servers rather than having to stream music via the device. That both saves the battery on the smartphone or tablet and frees the phone to take calls without interrupting the music. 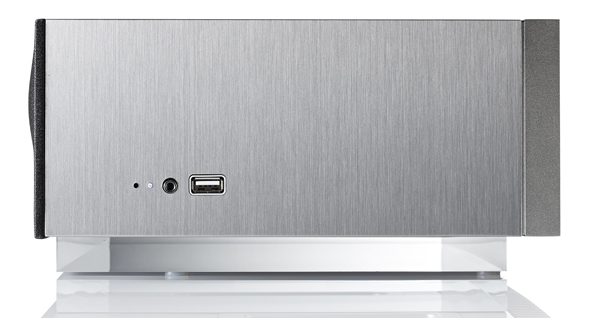 Mu-so can also connect to Naim’s multiroom system, receiving music from other Naim devices on the same network set up for multiroom: these include the NDX, ND5 XS, NAC-N 172 XS, SuperUniti, NaimUniti, UnitiQute and UnitiLite. Three drive units are used for each channel, with a central oval woofer (tuned with a downward-venting port) and a conventional round midrange driver straddling a dome tweeter – an arrangement mu-so project leader Trevor Wilson explains ‘simply gave us a better, more spacious stereo sound’ – and each driver is powered by its own 75W digital amplifier. As standard, the drivers are covered with a black full-width grille with a ‘wave’ profile recalling the shaping of the heatsinking on Naim’s Statement amplifier system. However, from October replacement grilles will be available for £70 via retailers and online: the initial choice will be ‘Vibrant Red’, ‘Deep Blue’ or ‘Burnt Orange’, and a neat touch is that the background to the new Naim app offers the same choice of colours, so you can customise it to match your mu-so. The sound is tuned using powerful digital signal processing running on a 32-bit processor. This gives a choice of two position settings, to adapt the sound to use of mu-so within 25cm of a rear wall or out in free space, and also a subtle loudness contour. Use the two options together, and you have a total of four sound contours from which to choose. I guess they’ve finally got there (as I have a system before me), but like the functionality of mu-so, the sound can be altered at any stage with the upload of new firmware: the system has an automatic update function over the Internet when connected to a network. I mentioned the way the grille profile echoes the Statement heatsink: another Statement touch is the acrylic base on which mu-so sits, giving it the appearance of floating when placed on a shelf or wherever. Built into this base is the illuminated white Naim logo – another Statement touch – but for those Naim fanatics bemoaning the lack of the familiar green glow, the white tell-tale can be turned off, along with the illumination on the main control on the top-plate. This control uses a contactless photo-interruptor system to receive and convey commands, and allows access to volume setting, input selection and other functions, and there’s also a slimline handset. However, I suspect most mu-so buyers will ‘drive’ it with the new app, either on iOS (below) or Android devices. It’s worth noting that iOS users can use their device to set up mu-so’s network connection: attach an iPad or iPhone to the USB socket on the righthand side panel – there’s also a 3.5mm stereo analogue input there – and press the pinhole button with an unfolded paperclip, and mu-so will connect with the iOS device and share its network settings. Non-iOS people can use a web interface to enter settings manually. Beneath those side-panel connections, in a metal housing shaped so cables exit the base of mu-so and to the rear, are sockets for power, Ethernet and optical audio input. But back to the apps – the Android version is shown left – , and being almost totally Appled-up I invested in a £100 Asus MeMo Pad to enable me to give both versions of the app a workout. I really like the new look and functionality, whether they’re used with mu-so or other Naim network products. The handling of tracks and playback in UPnP operation is slicker, and the whole thing has a crisper, more modern feel, making it even more enjoyable to use. And the performance of mu-so? Well, having lived with it for a few days, the highest compliment I can pay it is that it ‘does that Naim thing’: it communicates music (and indeed speech) so well that it’s easy to forget what you’re listening to, and simply enjoy what’s being played. Although I’m no great fan of Spotify, finding the sound too often a bit thin and given to ‘maximum loudness’ compression effects, mu-so’s combination of warmth and bass control, allied to a treble that’s detailed without ever becoming brash, made a wide range of tracks as enjoyable as I have ever heard them on Spotify. The balance also flatters Internet radio, from Naim favourite Radio Paradise’s hi-res stream to Radio 3 concert relays, and speech on Radio 4. And when writing this I realise I have just been listening for an hour to a Dutch classical station specialising in organ music, and enjoying it immensely. That’s the ability of mu-so to make music both easy to listen to and hugely enjoyable. But mu-so will also play CD rips, and hi-res content over a network up to 24-bit/192kHz in WAV or FLAC, and 24-bit/96kHz in ALAC, so with my (now recovered) NAS drives in harness, and a range of recordings from off-air radio to Studio Master classical and hi-res rock and pop, I was struck by two things, the first of which was just how well this system handles a wide range of music, to the extent that I soon wasn’t missing my usual reference system too much. I’m used to listening with tablet in hand – it’s usually an iPad mini, but this time I was giving the Android app an outing –, but with mu-so in harness there was an ease and simplicity to the listening experience, helped in no small part by the fact the slim front profile helps the system deliver the music without dominating the room in a visual sense, making the whole thing just a little bit more magical. The other major discovery is that mu-so is able to deliver a lot of sound, and do so entirely without fuss: there’s more than enough level to fill even a large room with sound at serious levels without the system showing any signs of stress, and it’ll kick hard when required even at high basic playback levels, making the sound both forceful and hard-charging when it needs to be, and smoothly detailed and involving with less full-on music. As I said, it does the Naim thing: it draws you in, and then holds the attention with the quality of what’s being played, while getting out of the way of the music and making you forget what’s playing it. There’s been a lot of discussion about what mu-so is, and who it’s really for: is it the perfect add-on for anyone with existing Naim network audio equipment, enabling music to played in a further room, or multiroom music to be sent from the main system to, say, the kitchen or study? Is it a way of attracting newcomers to the Naim brand with a product designed to be used as a main-room music system combining both style and performance? Or is it a way of getting the Naim sound without all those black boxes, offboard power supplies and stiff cables? I’d say the answer is ‘all of the above’: I am sure mu-so will attract those buyers just wanting a simple, flexible and high-quality sound system that’s both a talking point and also discreet enough to blend into a room and deliver great sound without taking the place over. It should also do a good job of exposing the Naim brand to a lot of buyers who would never normally set foot inside a hi-fi shop. But at the same time, I don’t think the Naim faithful have anything to fear from mu-so: it may be very different from anything the company has made to date, but for all the ‘differentness’ the usual Naim values, and the Naim sound, are very much intact here. The mu-so is the spiritual successor to Meridian’s F80. To date there has been nothing to touch it sound wise (non-believers queue at the door with your offering please). Ignoring the obvious differences in functionality have you any feel for how they compare sound-wise? Not which is better, not whose dad is bigger. More whether they are in the same bracket – are we talking Ferrrari vs Lamborghini here, or is one more at the BMW level (if so which). I noticed you looking rather taken with the Eclipse TD-M1 at the Bristol Show earlier this year. I thought the sound from that pair of sonic eggs was incredible. I particularly like their ability to throw out a 3d image and give a real sense of timing. Is the mu-so in the same league? Does it convey greater scale? Or am I comparing apples with oranges? Yes, I think it’s a bit A with O, but as yet I haven’t had a chance to listen to the TD-M1, so really can’t compare. Silly question: Could the Mu-so be used it like a sound base? Would it take the weight of my Panasonic 32″ flat screen? As the top-mounted control suggests, that’s not really the intention. Pity that, as the control seems to be a largely redundant styling exercise for sinister types. Can it be used with headphones? Ignoring the differences in functionality, have you any idea how it sound-wise compares to the B&W A7? It is superior? The A7 isn’t a unit of which I have any experience, so impossible to draw any comparisons, soundwise or otherwise. Sorry. Ok, thanks for the answer anyway! How sensible is your position to the box? What is the stereo rendition of the mu-so, and how far should you or can you sit from the box to enjoy the best (stereo) sound? Well, I wouldn’t sit right next to it, but beyond that anything from 2m or so to across a large room the stereo image is good. Thanks, that’s an important information. With the given dimensions, I thought you’d have to sit closer than 2 or 3m to have a good stereo image. How does it compare to B&W A7? The A7 is pretty qualified, have one at home. As I’ve already said, it’s not a direct comparison I’ve done, sorry. Re Spotify “compression effects”, are you sure you haven’t left the “Set same volume level for all tracks” box ticked? It doesn’t just normalise all tracks to the ‘same volume’ (as I am sure was their original intention but just didn’t work sensibly in practice), but does heavy dynamic compression. If you turn it off there is no further compression, as far as I can tell with the music I Iisten to. No, Spotify sounds more than bad enough without introducing extra level-normalisation! Hello Andrew. Is that your view on the Ogg Vorbis codec in general? And have you been listening to Spotify in ‘Premium’ form? i.e. (hopefully) 320kbps? My experience with Spotify Premium is pretty good, I have to say. Haven’t done enough comparative listening to Ogg Vorbis to have an opinion, and yes of course using the Premium option. A chap in John Lewis told me I could play my Blue Ray player and Skybox through my TV into this box but when I asked him how to told me the woman who knew was having a tea break. Do you think this is possible as it sounded very good in the shop and my wife would love to see the back of my Pioneer black lump, sub woofer and bookcase speakers that need to be replaced. Curious to know if this would be a good alternative to the Sonos Playbar. Appreciate the sound is bound to be far superior over the soundbar, and the fact it has AirPlay must surely rival the streaming ability of the Sonos, but….. could the Naim be used as a soundbar to listen to TV / film and not sound flat. I’m after a soundbar and would love this to be the solution so I could upgrade my Denon / Pioneer ageing separates at the same time. Hi, thanks for the excellent review. Is Spotify the only streaming service it works with … and do you know if they might add Qobuz? At the moment, yes, only Spotify. No information as yet on any future plans. I have naim SBL speakers naim 160 amp naim 72 pre amp and a naim CD 3 getting old but serviced. I love the drive and detail naim give,now my ears have lost there top end and looking for a small set up as I’m downsizing will the mu-so give me my naim sound ? 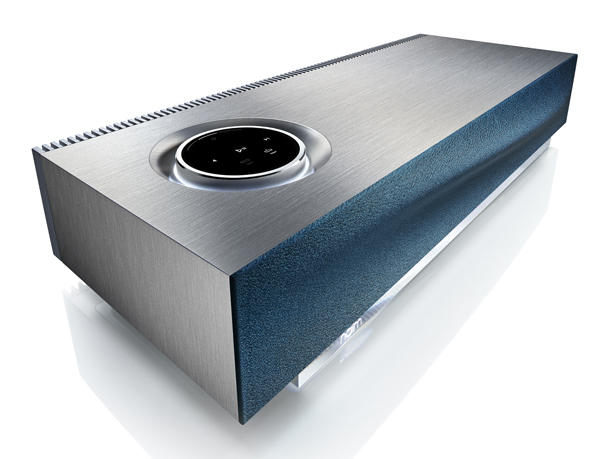 Yes, the mu-so has very much the Naim sound, but it may be just too big a step down from your current system. I’d suggest having a listen to one of the Uniti range and some smaller speakers. Hi good review, thanks. As I need a second system in our large kitchen/ diner, which does host parties so needs to go loud, would the Muso produce a better quality loud sound than two Sonos speakers, which would cost about the same? I agree with the very positive review on most counts. However, I do have one bone to pick with the mu-so that really bothers me. If you choose to send it an airplay signal, the mu-so will automatically switch to the airplay input and play the music. Wonderful. That’s how it should work. HOWEVER, it only works in that direction. If you want to watch TV, and indeed you turn the TV on such that it’s sending a signal to the mu-so, it will not automatically switch to the TV input, *even if there is no airplay signal at the time!! * You have to use the app, remote, or button on the unit itself to manually switch to the TV input. I wish this weren’t so. Not the end of the world, but a PITA. Shame to hide it away but, how well do you think it would perform in the ‘box’ of an open shelf in a tv supporting wooden unit? A wooden alcove in effect. There is some adjustment for close to wall or free-space positioning, but even with the former engaged I can’t help but feel that such a location might add a rather unpleasant ‘boxy’ coloration to the sound.